Texas History Mural at the Texas State Archives and Library Building. Courtesy of the Caesar Kleburg Wildlife Research Center and the Texas State Library and Archives Commission. Image available on the Internet and included in accordance with Title 17 U.S.C. Section 107. Cannons were fired during the Archive War. Courtesy of Texas State Library and Archives Commission. Image available on the Internet and included in accordance with Title 17 U.S.C. Section 107. TEXAS STATE ARCHIVES. The Texas State Archives are made up of the documents and records from the various periods of Texas history: Spanish Texas, 1731–1820; Mexican Texas, 1821–36; the Republic of Texas, 1836–45; the state of Texas, 1846-present. The collection of eighteenth and nineteenth century archival material is remarkably complete, considering the vicissitudes that have marked the history of Texas. In 1836, so the Texas documents would not fall into Mexican hands, they were moved from place to place by the ad interim government as Sam Houston's retreating army moved eastward; some of the archives were lost. In 1836, the capital was Columbia; in 1837 the new town of Houston became capital (see CAPITALS). In both cases the archives were moved also. In 1839 a fleet of fifty wagons took the archives to the new capital, Austin. Indian attacks and the Mexican invasions of 1842 caused Sam Houston to order the removal of the archives to the temporary capital, Washington-on-the-Brazos, thus bringing on the Archive War. The treasurer's office burned in 1845, but with only slight loss. In 1855 the adjutant general's office burned with the irreparable loss of the muster rolls of the soldiers of the Texas Revolution. The state capitol burned in 1881. Fortunately, there was but slight loss of documents. The departments and their records were subsequently crowded into whatever space could be found until the present Capitol was completed in 1888. Concern for the archives motivated a number of government actions. Under the provisional government, the republic, and the state in the early years, in order to establish and defend land titles, attempts were made to concentrate and protect the archives by collecting the records of the several land offices in what later became the General Land Office. An attempt at concentration of archives in the state department began in the 1850s, when the archives deposited at Nacogdoches and at San Antonio, capitals of the department of Texas under Mexican rule, were transferred whole or in part to Austin. The great majority of the documents transferred were from the Nacogdoches Archives, although a few originals and some 2,000 pages of translation were sent from the Bexar Archives at San Antonio. In the state department also were concentrated many records of the departments of the republic. DeWitt C. Greer Building in Austin. Image available on the Internet and included in accordance with Title 17 U.S.C. Section 107. Camp Mabry Division Headquarters Administration Buildings. Courtesy of Austin Public Library and the Portal to Texas History. Image available on the Internet and included in accordance with Title 17 U.S.C. Section 107. Quonset Hut at Camp Hubbard in Austin, circa 1960. Courtesy of the Society of American Archivists. Image available on the Internet and included in accordance with Title 17 U.S.C. Section 107. Texas State Archives Building, later named after Lorenzo de Zavala, under construction, circa 1960. Courtesy of the Society of American Archivists. Image available on the Internet and included in accordance with Title 17 U.S.C. Section 107. Lorenzo de Zavala State Archives and Library Building in Austin. Image available on the Internet and included in accordance with Title 17 U.S.C. Section 107. The law establishing the Department of Insurance, Statistics, and History, passed in 1876, made the Texas State Library the legal depository of the archives of the state and the office of record for all reports and papers issued by the several departments. Between September 25, 1877, and July 5, 1879, many documents were transferred, chiefly from the state department, after which the work ceased. After the building of the Capitol, the transfer of archives started anew and continued almost constantly thereafter. Most republic-era records held by the secretary of state went to the State Library in 1904–05. More archival records were transferred in the 1930s and 1940s, when crowded conditions in the Capitol forced the departments to make room for current records. In 1933, to alleviate the "congested condition" of state departments and to provide for management of records, the Forty-third Legislature instituted the Bureau of Records, under the supervision of the Board of Control. 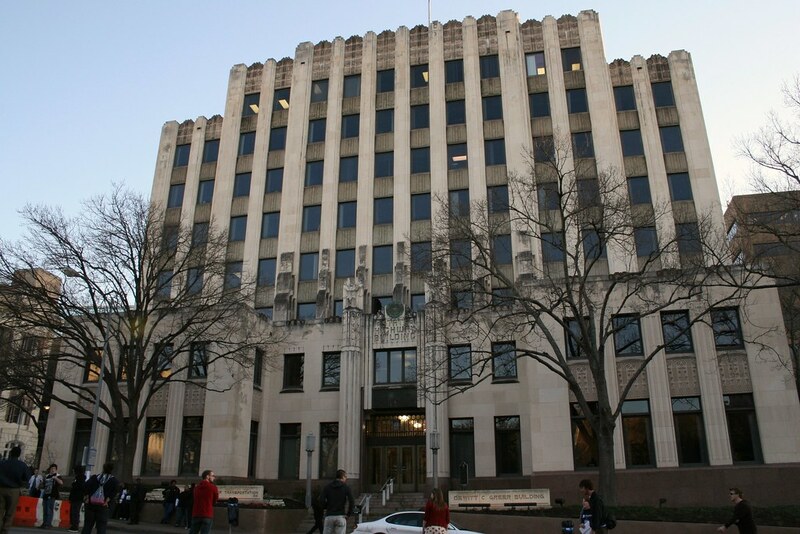 The bureau was located in the basement of the DeWitt C. Greer Building, where it provided fireproof storage and access to noncurrent records for the agencies. The space freed in the Capitol basement was allotted to the Archives and History Division of the State Library. By 1937 crowded conditions, constant damp, and the installation of a new sprinkler system made the basement a hazardous place for the archives. Although the most valuable of the records were moved that year to the main floor of the library, many remained in place, usually filling their subterranean storage areas from floor to ceiling. Expansion of the State Library's holdings in the next ten years forced off-site storage of government publications and archives in a number of locations: the Texas Confederate Home, Camp Mabry, and a cowbarn and annex in North Austin. By 1947, when the legislature transferred records management from the Bureau of Records to the State Library, many of the records had deteriorated almost completely. The Capitol basement was finally cleared when the archives were moved to the basement of the Greer Building in 1950. Records from the cowbarn and annex were moved to warehouses in South Austin in 1952. The improved conditions did not last long, however. In 1956 a Quonset hut at Camp Hubbard in northwest Austin became the new home for the archives. The move brought on a "Second Archives War." 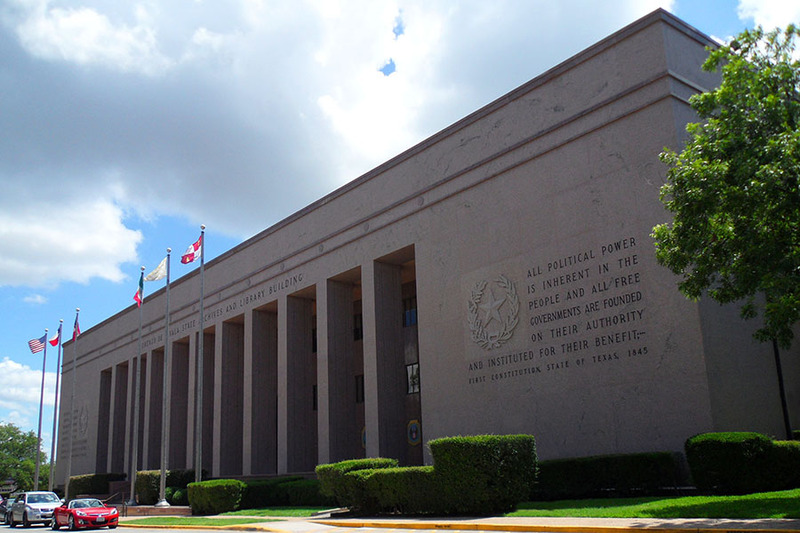 Citizen concern and the support of Governor Price Daniel, Sr., resulted in the construction of the Lorenzo de Zavala State Archives and Library Building, completed in 1961, which currently houses the archives of state government. The 1947 law that authorized the State Library to establish and maintain a records-administration division to manage all public records of the state has helped to ensure a more systematic approach to preserving the archives of Texas. By 1963 agency heads were required to establish records-management programs within their agencies, while making sure that the agency's organizations, policies, functions, and activities were documented, and that records schedules were prepared to facilitate the orderly disposition of the agency's noncurrent records. Currently, overall responsibility for state agency records rests with the State Library, assisted and advised by the Records Management Interagency Coordinating Council. The State and Local Records Program of the State Library helps schedule records, provides microfilm services, and records storage for the state. The move toward the local-records program began in 1971. Before that, county archives remained in the courthouses, many of which had been destroyed by fire. The Sixty-second Legislature established regional depositories for local records throughout the state, operated through the State Library. The 1971 law permitted local officials to offer or lend their records to the regional depositories. In 1989 the legislature strengthened the state's commitment to local-records management by requiring local-records officers to establish management procedures and prepare schedules. As the twentieth century came to an end, a new challenge to archive preservation emerged with the rapid expansion of electronic technologies. The rate of change in computer hardware and software and in electronic storage media often outpaced the ability to transfer successfully all of the archival electronic records scattered among the less essential data. Some records remain locked in outdated computers, inaccessible for all practical purposes. Map of Early Departments of Texas. Courtesy of the Texas State Library and Archives Commission. Image available on the Internet and included in accordance with Title 17 U.S.C. Section 107. Document of the Nacogdoches Archives. Census Statistics of the city of Guadalupe of the state of Coahuila y Texas, 1831. Courtesy of the Texas State Library and Archives Commission. Image available on the Internet and included in accordance with Title 17 U.S.C. Section 107. The Nacogdoches Archives are in the State Library and with the Bexar Archives constitute what is known as the Spanish Archives. The Bexar Archives were deposited at the library of the University of Texas in 1898 by the commissioners' court of Bexar County. In addition, there is also a great mass of miscellaneous papers on colonization, Indian affairs, army and navy, post office, Austin city lots, Galveston lots, boundaries, the Texan Santa Fe expedition, the penitentiary, and railroads. The archives of the adjutant general's office consist of a large number of muster rolls and payrolls of the soldiers of the republic and of the early ranger forces of the state; some thousand or more Confederate muster and pay rolls; rolls of the State Police, state guard, and reserve militia of the Reconstruction era; rolls of the rangers of the postwar period known under several names-frontier forces, minute men, Frontier Battalion, and Texas Rangers; rolls of the militia known as the Texas Volunteer Guard, Texas National Guard, and Texas State Guard; and rolls of the soldiers of the Spanish-American War. In addition, there are enlistment papers, records of bonds and oaths, certificates of service, quartermaster's papers, ordnance papers, correspondence, and reports. The archives of the comptroller or public accounts and state treasurer comprise financial records of the republic and state, the currency, bonds, other obligations, cash books, custom registers, bond registers, warrant registers, tax records, ledgers, journals, reports, letter books, civil-service records, and a voluminous correspondence. Among the most valuable records of the comptroller's office are military service records, public debt papers, and claims papers. The military service records include the money claims for service of the soldiers of the Texas Revolution and republic, which, with the bounty certificates in the land office, are in most instances the only such official records extant. The public debt and claim papers are of similar nature, being the claims against the Republic of Texas and their payment or rejection after annexation and the passage of the public-debt acts (see DEBT OF THE REPUBLIC OF TEXAS). Texas pensioned her soldiers of the revolution, the republic, and the Confederacy; the pension papers are a part of the records of the comptroller's department. A few school ledgers and journals, letter books and school census records of the 1850s are a part of the archives of the treasury department, the treasurer being ex officio state superintendent of education at that time. The board of education is of later establishment (see TEXAS EDUCATION AGENCY); its records, dating from the 1860s and 1870s, consist of minutes of the board of education, registers of county school boards, journals, ledgers, letter books, school population, records of normal schools and colleges, and other documents. Letter from Kelsey Douglass to Albert Sidney Johnston, 1839, from the Mirabeau B. Lamar Papers. Courtesy of the Texas State Library and Archives Commission. Image available on the Internet and included in accordance with Title 17 U.S.C. Section 107. Letter from Sam Houston to John Linney, 1836, from the Andrew Jackson Houston Papers. Courtesy of the Texas State Library and Archives Commission. Image available on the Internet and included in accordance with Title 17 U.S.C. Section 107. Most of these records have been transferred to the State Library. Notable exceptions are the most recent charters and laws, which remain in the State Department. The Land Office archives remain in the department. The archives of the Supreme Court and the attorney general's office, along with those of the Third and Fourth Courts of Civil Appeals, are now in the State Library. The archives of the Railroad Commission, the Texas Department of Health, and the Board of Control have also become part of the holdings. County records of interest for family research, such as deeds, wills, and marriage and probate records have been microfilmed by the Genealogical Society of Utah and are available on loan through the regional depository system. Much manuscript material formerly in private hands has found its way into public archives, some by purchase, some by gift. The papers of Mirabeau B. Lamar (1789–1859) contain personal letters, official documents, and a great number of historical papers. In 1909 they were purchased for $10,000 by a special act of the Thirty-first Legislature. The John H. Reagan papers (1847–1905) were also purchased in 1909 for $10,000 by a special act of the same legislature. Both collections were deposited in the State Library. The state library also received the Andrew Jackson Houston collection of Sam Houston papers, donated by A. J. Houston's daughters. Several other collections of papers related to Sam Houston and his family have been deposited in the Sam Houston Regional Library and Research Center in Liberty. In the University of Texas library there are many mixed personal collections, notably the Stephen F. Austin papers (1780–1837) the Thomas J. Rusk papers (1835–59), and the Ashbel Smith papers (1824–86). Other individual collections are those of Washington D. Miller, George W. Smyth, Hugh McLeod, James Morgan, David G. Burnet, and Samuel May Williams. Some are in the State Library, others in the University of Texas library, and still others (the three last named) are in the Rosenberg Library at Galveston. The Texas State Archives also hold transcripts and photostats of documents pertaining to Texas from the British Public Records Office, the Archivo General de México, the Archivo de Govierno in Saltillo, the Archivo General de Indias in Seville, the Cuban Archives at Havana, the Archives of Matamoros, and the Franciscan records from Mexico City. Microfilms of some records have been obtained. The census bureau many years ago turned over to the State Library the manuscript census records for Texas from 1850 through 1880 except the population schedule. Microfilms of this schedule of the censuses for 1850 through 1920 have been obtained. A number of the Texas archives have been edited and printed. B. F. Shumard's A Partial Report on the Geology of Western Texas was published in 1886; C. W. Raines (ed. ), Speeches and Papers of James Stephen Hogg, Ex-Governor of Texas, was published in 1905. The journals of the congresses of the republic and their laws have been printed, as have the state journals and laws. The reports of the departments of the Supreme Court and of the Texas Court of Criminal Appeals have been published. The first volume of the supreme court reports, Dallam's Decisions, dates back to the republic. From 1906 to 1946 the attorney general published opinions as an appendix to the biennial reports. Since 1947 the Digest of Opinions has appeared as a separate publication. The first volume of Abstracts of Titles of Patented Lands appeared in 1838, and others were published during the republic and early statehood. Since 1875 these volumes have been issued yearly by the General Land Office and comptroller's department. In 1941 the sixty-two volumes were reprinted in eight volumes, and periodic updates continue to be issued. Other archives printed at public expense include: E. W. Winkler (ed. ), Secret Journals of the Senate Republic of Texas, 1836–1845 and Journal of the Secession Convention, 1861; Sinclair Moreland, Governors' Messages, Coke to Ross, 1874–1891; Charles Gulick et al. (eds. ), The Papers of Mirabeau Buonaparte Lamar; Harriet Smither (ed. ), The Journals of the Fourth Congress of the Republic of Texas, 1839–1841, and The Journals of the Sixth Congress of the Republic of Texas, 1841–1842. The Journals of the Ninth and Tenth Legislatures of Texas, 1861–1863, were edited by James M. Day. Other publications include The Indian Papers of Texas and the Southwest, 1825–1916, edited by Dorman Winfrey and James Day, Legislative Messages of the Chief Executives of Texas (1835–1846), edited by Price Daniel and James C. Martin, The Post Office Papers of the Republic of Texas 1836–1840, edited by James M. Day, and Texas Treasury Papers: Letters received in the Treasury Department of the Republic of Texas, 1836–1846, edited by Seymour V. Connor and Virginia Taylor. Other Texas State Archives holdings have been published by the American Historical Association: George P. Garrison (ed. ), Diplomatic Correspondence of the Republic of Texas, and volumes one and two of Eugene C. Barker (ed. ), The Austin Papers. The University of Texas Press has printed Amelia Williams and E. C. Barker (eds. ), The Writings of Sam Houston, 1813–1863. Joseph M. Nance (ed. ), "The Letter Book of Joseph Eve, Charge d' Affaires of the United States to Texas, 1842–1843," appeared in the Southwestern Historical Quarterly. W. C. Binkley (ed. ), Official Correspondence of the Texas Revolution, 1835–1836 was prepared for press and published from the income of the Albert J. Beveridge Memorial Fund. John H. Jenkins edited The Papers of the Texas Revolution, 1835–1836 (1973). The State Library has also produced a number of microform publications of Texas archives, including the Executive Record Books of the Presidents and Governors of Texas, 1835–1907; Registers of the Elected and Appointed Officials of Texas Government, 1836–1971; the 1867 Voters' Registers; the Confederate Home Roster; and the Nacogdoches Archives. A number of archival documents and historic relics from various Texas collections were used in producing the CD-Rom Victory or Death, an interactive study of the battle of the Alamo and other Texas Revolution battles. Handbook of Texas Online, Harriet Smither and Jean Carefoot, "TEXAS STATE ARCHIVES," accessed April 19, 2019, http://www.tshaonline.org/handbook/online/articles/lct06.